Doctor Tracy Walker grew up in West Virginia just East of Elkins along the Cheat River. 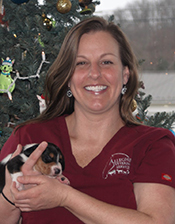 Dr. Walker completed her veterinary training at the University of Georgia College of Veterinary Medicine, where she focused her studies on large animal medicine and surgery. 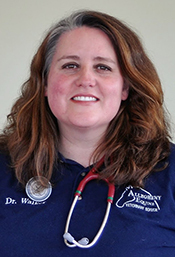 Upon graduation from veterinary school, Dr. Walker remained at the University of Georgia for advanced clinical training in an equine and large animal internship. In addition to her formal training, Dr. Walker has traveled to various areas of the country and gained invaluable experience in sport horse medicine, mare management, and foal care. 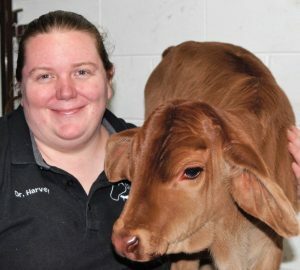 Although much of her background is in the equine industry, Dr. Walker is also very experienced in beef cow, dairy cow, goat, and even llama medicine. Dr. Walker has returned to West Virginia, deciding that there is truly no place like home! Dr. Walker is very active in many organizations that give back to the community and the veterinary profession. Locally, she serves on the Randolph County Park and Recreation Board, Randolph County 4-H Leaders, and the Randolph County Regional Riding Club. 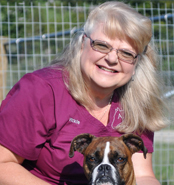 At the state level, Dr. Walker has served as a board member for the West Virginia Veterinary Medical Association. Dr. Walker was also honored to become a member of the American Association of Equine Practitioners Professional Conduct and Ethics Committee in 2012. Dr. Walker is also a member of AQHA, NCHA and a certified veterinary judge for the American Endurance Ride Conference. In her spare time, Dr. Walker enjoys spending time riding any of her eight quarter horses and showing her cutting horse. Adam grew up in Randolph County. He graduated from AB University in 2016 with a Bachelor of Science in Biology and Environmental Science. Adam has volunteered and worked as an adoption specialist at the Randolph County Humane Society since 2007. 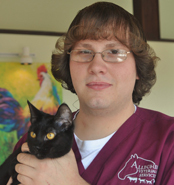 Adam would like to pursue a career in veterinary medicine and will apply to veterinary school soon. In his free time, Adam enjoys spending time with his dogs, Lola and Lucy, and his cat, Winifred. Adam is currently pursuing a veterinary technician degree through an AVMA accredited program and credentialing as a Registered Veterinary Technician. We are so proud to have Adam as a part of our treatment team! Vickie joined our team in September of 2015. Vickie is an Elkins native and brings with her years of experience in the health care profession. Vickie is friendly, approachable, and an asset to our team as she welcomes clients to the practice. In her spare time, Vickie enjoys spending time with her husband and grandchildren. Vicki resides on a farm with her dog, Bailey, a horse, and a pony.